Born in Prague, steeped in both European and Latin American musical traditions, Topferova now lives in New York, where she has forged a strongly European, Latin nuevo-jazz sound. This recording, all sung in Spanish, offers her original sound, and original songs, backed by an ensemble focused around her voice and Edmar Castañeda's South American folk harp, joined by violinist Jenny Scheinman, French horn from Chris Comer, Angus Martin's accordion, flutist Yulia Musayelyan, percussionists Neil Ochoa, Urbano Sanchez and Chris Eddleton and Topferova's own cuatro and guiro. The record label says: 'The Tide' features ten original songs sung in Spanish and set to rhythms ranging from Cuban son to Venezuelan vals, merengue and gaita, accompanied by instrumentation including the Colombian harp, the French horn and the four-string cuatro. Topferova’s songs are musical paintings, the lyrics filled with carefully etched images and landscapes, the melodies colored with distinctly defined moods and textures. While you can hear that Topferova’s influences come mainly from the Cuban songbook, musica llanera (“music of the plains” tradition in Colombia and Venezuela), and bossa-nova, her compositions also reflect a touch of her background in classical music and the folklore of her native Czechoslovakia. 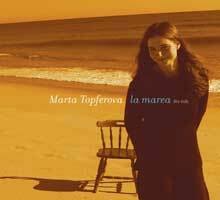 Topferova’s voice is a rich contralto, and here she is also an arranger and producer. Performers include Edmar Castañeda on harp, bassist Pedro Giraudo, French horn player Chris Komer, accordionist/pianist Angus Martin, violinist Jenny Scheinman, flutist Yulia Musayelyan, percussionists Neil Ochoa, Urbano Sanchez and drummer Chris Eddleton offer ensemble setting worthy of the global village where the singer lives, New York City. Marta started singing at age eight in her native Prague, Czech Republic with the Mládí choir. Upon moving to the US in 1987, she continued her vocal and music studies with The Seattle Girls' Choir. At an early age, she sang in many different languages including Latin, German, Spanish, French, Russian, Finnish and Czech, as well as a wide range of works by Brahms, Hayden, Poulanc and Pergolesi to name a few. She toured Germany and Finland participating in choral festivals in 1985, 1986 and 1990. Her first two recordings were a collection of songs inspired by children's poetry from the Terezín concentration camp, and A Ceremony of Carols by Benjamin Brittain, both with The Seattle Girls' Choir. But Marta's first encounter with Latin American music goes back to when she was six years old, she remembers her favorite album being Inti-Illimani's songs from the Andes. Her parents, both actors, had gotten the record from a Chilean friend that had come to live in Czechoslovakia in the 1970's. So around age fifteen, when she started developing as a soloist, exploring her own style and direction as a singer, she was again completely drawn to music from Spain, Cuba and South America. She was particularily inspired by Camaron De La Isla, Paco De Lucia, Mercedes Sosa, Atahualpa Yupanqui, Joao Gilberto, A.C. Jobim, Vinicius Da Moraes, Ornella Vanoni, Guillermo Portabales, Eliades Ochoa, Benny More, Los Compadres and Simon Diaz. Continuing in her musical calling, she first majored in music and dance at Bard College from 1992 to 1993. Afterwards, she moved to Moron de la Frontera, Spain, to study privately and further develop as a musician. She took up playing the guitar, hand percussion and now most recently, her favorite accompanying instrument, the four-string cuatro. Her love and dedication to Latin American music as well as the folklore of Czechoslovakia, makes her a unique artist who sings in and is fluent in both Czech and Spanish. After spending two years in Spain and the Czech Republic, she settled in New York City in 1996 and since then has been actively composing, arranging and performing her original songs as well as collaborating with other groups including Lucia Pulido and Fiesta De Tambores, Los Acustilocos, Flamenco Latino among others. Marta has performed in many venues in New York City including Joe's Pub, The United Nations, Sweet Rhythm, The Duke Theater on 42nd Street and across the United States in cities such as Boston, Cleveland, Miami, San Francisco and Portland. She's also participated in festivals such as The World Music Festival in Chicago, and been featured on television and radio programs in the US, the Czech Republic and Mexico, including BBC's "The World" and NPR's "Around Noon".